If you're in search of a casual yet totally stylish outfit, consider teaming an Eckhaus Latta longsleeved t shirt with yellow culottes. Both garments are totally comfy and will look fabulous together. Up the cool of your ensemble by finishing off with black elastic ankle boots. 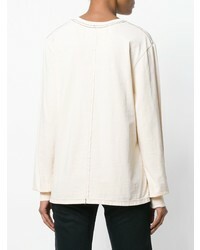 This pairing of an Eckhaus Latta longsleeved t shirt and black leather skinny pants is perfect for off-duty occasions. Dress down your getup with black leather ballerina shoes. If you're in search of a casual yet absolutely chic look, team an Eckhaus Latta longsleeved t shirt with a pink pleated midi skirt. Both items are totally comfy and will look fabulous together. Spruce up this outfit with burgundy leather ankle boots. If you're searching for a casual yet absolutely chic look, team an Eckhaus Latta longsleeved t shirt with charcoal flare jeans. Both items are totally comfy and will look fabulous together. If you're after a casual yet absolutely chic getup, rock a beige long sleeve t-shirt with blue ripped skinny jeans. Both items are totally comfy and will look fabulous paired together. You could perhaps get a little creative in the footwear department and elevate your getup with charcoal suede ankle boots. If you're on the hunt for a casual yet totally stylish outfit, choose a beige long sleeve t-shirt and a grey fair isle sweater dress. Both garments are totally comfy and will look fabulous together. 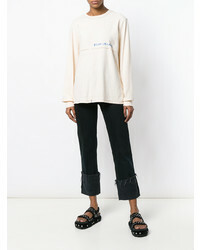 If you're on the lookout for a casual yet absolutely chic getup, rock an Eckhaus Latta longsleeved t shirt from farfetch.com with a white lace mini skirt. Both pieces are totally comfy and will look fabulous paired together. Dress up this outfit with beige suede over the knee boots. If you're hunting for a casual yet chic outfit, opt for an Eckhaus Latta longsleeved t shirt and a black leather mini skirt. Both items are totally comfy and will look fabulous together. Amp up the cool of your look by complementing it with black suede over the knee boots. If you're hunting for a casual yet stylish ensemble, pair a beige long sleeve t-shirt with a navy denim pencil skirt. Both garments are totally comfy and will look fabulous together. When it comes to footwear, this getup is finished off nicely with red cutout leather pumps.